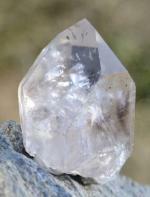 This is a relatively new Quartz species from Inner Mongolia. Only one pocket was found, we bought half and it's now empty. 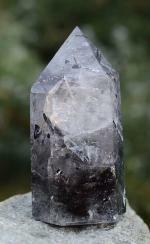 The completely unique dual core is a glassy interior, part dark purple and part clear quartz. They are not phantoms, but a hexagonal core that simply changes colour after a few centimetres. The exterior is also a beautifully gemmy blue-green, caused by hedenbergite inclusions, which when angled in light displays a lustrous satin sheen. Seriously rare. 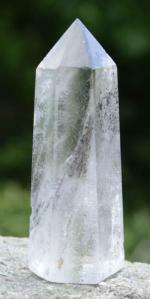 The tip has a tiny ding as seen in the larger pictures - hence price. 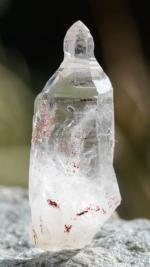 "Red phantom quartz crystals additionally contain the properties of limonite, kaolinite and hematite. These crystals are rare. 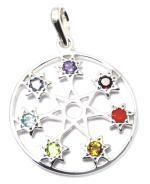 The red phantom is also used to stimulate the first 3 chakras, to combine the energies to produce highly recognisable vitality directed toward creativity, intellectual advancement and intuitive endeavours." Melody, Love is in the Earth. Made with handpicked, energetic gems. Set with open backed settings for maximum energy transfer to the wearer. 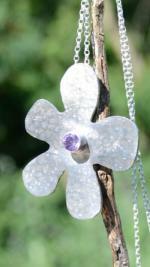 Sterling silver. 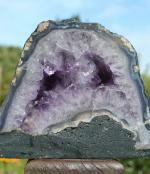 Just over 3KG of Agate encircled Amethyst Church Geode beauty. 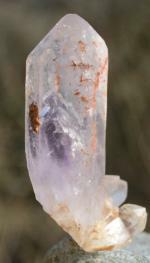 "Amethyst is a "stone of meditation”, being excellent in conducting the energy of calm and peacefulness to help one both enter and maintain the states. 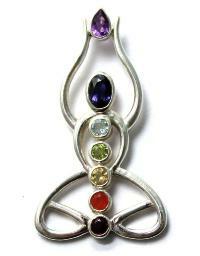 It opens and activates the crown chakra.” Melody, Love is in the Earth. 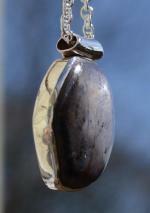 This beautiful Smokey is in excellent condition with many beautiful, bright garnets. 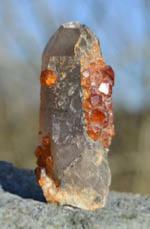 The orange garnet smoky combination is the most powerful base and sacral (sexual) chakra combination. "Iolite produces an electrical charge when in contact with one's auric field and can both strengthen and align this field with the subtle bodies.” Melody, Love is in the Earth. Handmade with love at Kacha Stones. 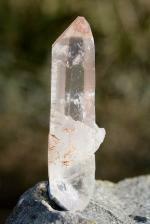 All stones are natural and untreated. 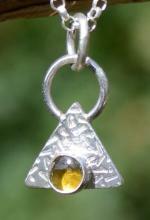 A top-grade faceted Blue Kyanite set in gold on hammered sterling silver. 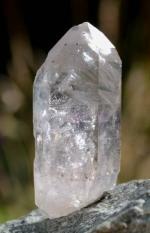 "Kyanite aligns all chakras automatically and immediately, with no conscious direction.." Melody, Love is in the Earth. Handmade at Kacha Stones with love and natural untreated gemstones. 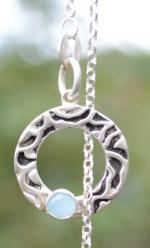 A 5mm Larimar in a unique Sterling silver necklace. Larimar (blue pectolite) is a rare gemstone. 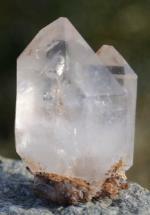 Found in only one location: a mountainous, inaccessible area in the province of Barahona of the Dominican Republic. 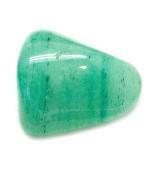 First mentioned in a request to mine Larimar in 1916, but relatively unknown until the 1970’s. 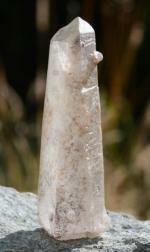 Edgar Cayce's "Atlantis Stone". 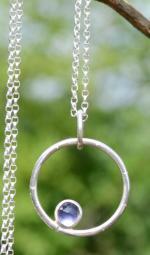 33mm, 6 grams, 22"/56cm Sterling silver chain. 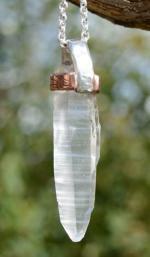 A 55mm clear, bright and striated Lemurian Quartz in silver and copper. 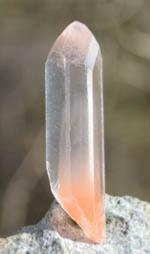 "Copper can conduct electrical impulses and can magnify the energy transfer, from the healer, or from minerals to the subject of the healing.” Melody, Love is in the Earth. 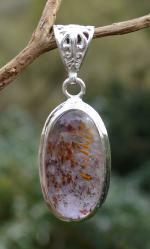 A 3mm untreated, natural, bright amber tourmaline cabochon in a sterling silver design. 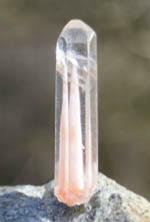 "Tourmaline and its inherent electrical emanations have been revered throughout the life of the planet.” Melody, Love is in the Earth. 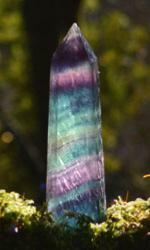 A 4mm untreated, natural Green Tourmaline cabochon in a one-off sterling silver leaf design. 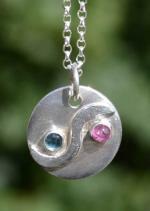 A 2mm untreated, natural Pink Tourmaline cab and faceted Blue Topaz in this one-off sterling silver Yin-Yang design. Hand-mined high in the Himalayas, the home of yoga. 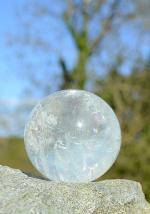 Beautifully energetic bright Quartz spheres. 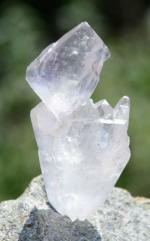 "Quartz can be used to clear and activate the energy centres of the body." Melody, Love is in the Earth. 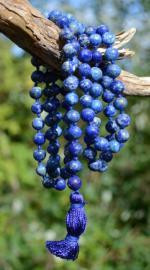 Ethically mined Lapis mala. 108+1 beads and knotting between each bead. 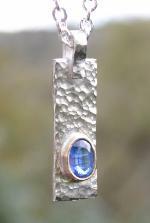 "Lapis Lazuli energizes the throat chakra. 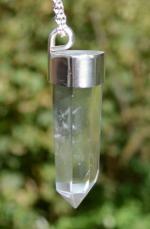 Augments strength, vitality, virility, mental clarity, illumination. 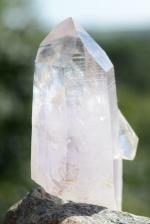 Enhances psychic abilities and communication with higher self. ” Melody, Love is in the Earth. 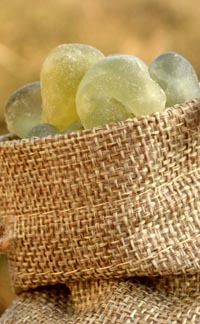 Ethically and traditionally hand-harvested organic, pure resin from the Dhofar region of Oman. 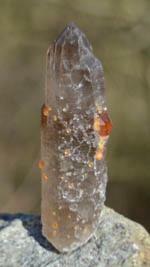 For much of its 9000 years of history, Hojari frankincense was harvested exclusively for royalty. First grade, large tears of the rarest and most potent of all frankincense. This translucent green resin overflows with fresh hints of eucalyptus, lime, menthol and pure Arabian magic. Uniquely medicinal, with ongoing clinical research including the treatment of cancer and depression. Comes in a reusable biodegradable hessian bag with drawstring. 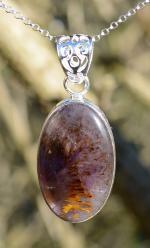 "Sugilite has been used in the treatment of all forms of dis-ease and attracts healing power. It has surfaced now to bring special healing powers to humanity. Sugilite is "a stone of love for this age”, representing the perfection of spiritual love and facilitating the manifestation of that energy on the earth plane.” Melody, Love is in the Earth. "Super Seven never needs cleansing or energising. Used to promote telekinetic pursuits, telepathy, clairaudience, awareness-channeling, universal creativity, to further healing on all levels.” Melody, Love is in the Earth. 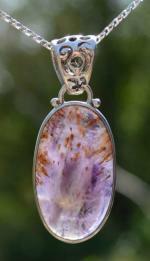 A 28 x 17mm exceptionally beautiful Super 7 cabochon handset in sterling silver. 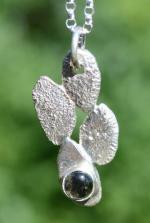 A 27 x 14mm exceptionally beautiful Super 7 hand set in sterling silver. 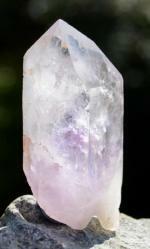 "Amethyst is a stone of meditation, It opens and activates the crown chakra.” Melody, Love is in the Earth. 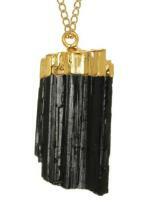 Black tourmaline is the first choice for protection from radiation and electromagnetic fields (EMFs), such as those given off by computers, mobile phones, TV's etc. 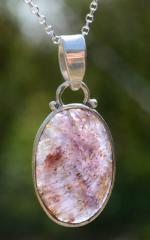 Natural, untreated stones set in copper and coated in pure gold are beautiful and energetic. 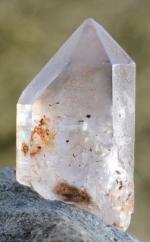 "Apatite aids in the development of the psychic gifts. 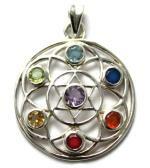 It brings harmony and balance to the energy bodies," Melody, Love is in the Earth. 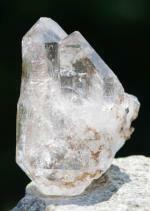 Apatite is also said to help with weight loss. 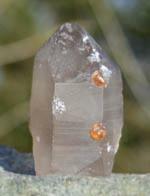 Stunning DT's and a stunning example of the unbelievably energetic crystals that formed within Calcite. Extraordinary in every way. Rare. Stunning Amethyst clouds in a fully intact and beautiful Brandberg. 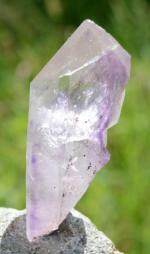 Amethyst partial Phantom in a fully intact and beautiful Brandberg. 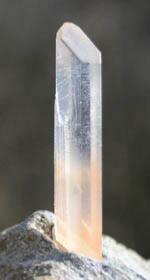 One side is self-healed and the tip has growth-interference - so although an unusual shape this crystal is basically intact. 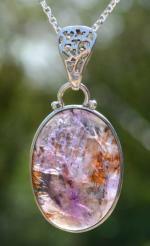 Purple lines form an amazing Amethyst Phantom. 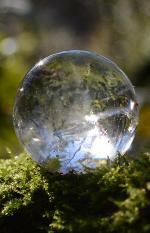 A tiny moving bubble and a clear and easily recognisable Master Self-Healed formation. Rare. 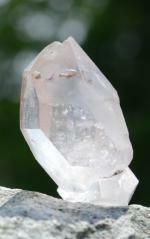 "If I have to pick my favourite quartz, it would be Brandberg Quartz! 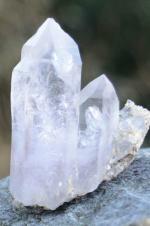 They are magic in a crystal!” The Crystal Bible. The bright red streaks of the Harlequin formation are more concentrated in the very tip and are best seen with a loupe or magnifying glass. 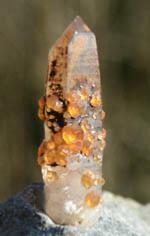 When I did this I noticed many beautifully formed internal DT crystals. 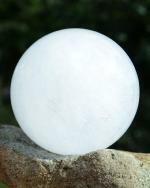 In the absence of a water bubble, another way to distinguish between an internal crystal - Manifestation crystal, and a crystal shaped water pocket - Negative Manifestation Enhydro, is that the negative usually has a geometric indentation. Refined etching, large water pockets and in excellent condition. A beautiful interior. 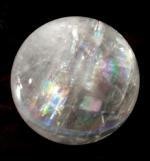 Polished to an energetic Generator tip, where all face sides form a precise point.